The history of the Ward Melville Heritage Organization and its affiliate corporation. Looking to escape the stresses of city life at the dawn of the twentieth century, Brooklyn residents Frank and Jennie Melville planned a Long Island summer retreat with their son, Ward. Intending to reach the popular Hamptons on the east end of Long Island, they accidentally boarded the wrong train and instead traveled to the hamlet of Stony Brook. Ultimately falling in love with the quaint village, Frank and Jennie immersed themselves in the local life. However, they were troubled by the growing effects of the Great Depression and the area’s collection of rundown buildings. Jennie urged civic cooperation among the three neighboring communities of Stony Brook, Old Field, and Setauket and tagged them the “Three Villages,” while Frank served on civic boards and the Chamber of Commerce. Succeeding his father as president of the Melville Shoe Corporation, Ward joined in his parents’ passion for conservation and economic development. He actively worked to formulate a plan to fulfill Jennie’s dream of a beautiful, planned business community with the help of his wife, Dorothy. Starting in 1939, Ward extensively renovated the Old Hallock Homestead he had inherited and renamed it the Three Village Inn. Dorothy became co-founder of the Suffolk Museum (now known as The Long Island Museum). Realizing the scale of their goal to preserve and maintain historic Stony Brook, Ward created a not-for-profit corporation, the Stony Brook Community Fund in 1939. It was later renamed The Ward Melville Heritage Organization in 1996. The organization would protect the historical and sensitive environmental properties that he would deed to it over the coming years. Ward Melville’s dream was to create a “living Williamsburg”. He envisioned a colonial-style village that would breathe new life into the area. Seeking community cooperation, Ward hosted a dinner at the Three Village Inn on January 19, 1940. 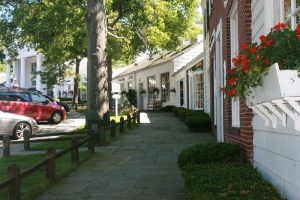 He presented his plans, designed by close friend and architect Richard Haviland Smythe, which included a crescent-shaped Village Center with connected shops grouped around a federalist-style post office. With a majority approval by the local people, the venture began at Ward Melville’s own personal expense of $500,000, or in today’s conversion, over $8, 000,000. He relocated, demolished, or modified some thirty-five buildings in the downtown area. The enormous undertaking also included the rerouting of roads, the relocation of large trees, and moving one million cubic yards of dirt. A two acre Village Green was created opening the vista to the harbor. The new Stony Brook Village Center, which now housed many of the existing businesses of old Stony Brook, was completed in the summer of 1941. It has long been recognized as the first planned shopping center in the country. In fact, it is where the American Institute of Architects held their annual meeting for many years. To learn more about WMHO check out this video.